After their summer tour of 1970, Crosby, Stills, Nash, & Young separated and traveled their own paths. They would go on to release a series of successful solo albums, and Crosby, Stills, & Nash would see success as CSN as they had in the past, prior to their touring and the release of the Déjà Vu album on Atlantic Records in March of 1970. Young gathered around him a band of players he enjoyed and referred to as The Stray Gators, and recorded his fourth album, Harvest. Some of the guest vocalists include Linda Ronstadt, James Taylor, David Crosby, Stephen Stills, and Graham Nash. The album is a sojourn back to a different time. From the first we are warmly coaxed into the music, at once beguiling, hypnotic, and addictive. Then there is the not quite melancholy, almost questioning narrative of Young’s vocals, which tempt us as much as the music. The images Young paints with his lyrics and the music are austere, but not harsh as they explore the everyday trials and triumphs of the human existence. It is as if we are voyeurs, peeking into the saga unfolding before us. 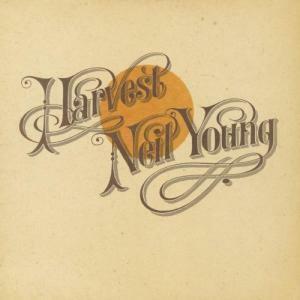 Harvest is rich in everything an album should be. There’s the drama and brilliance of “A Man Needs A Maid” and “Old Man.” “There’s A World,” is akin to walking through a mountain pass and as the the morning mist clears, we find ourselves entering a beautiful valley, spread before us as though placed there solely for our pleasure and awe. The strains of electric guitar that punctuate “Alabama” break from all the previous acoustic work, raising the level of urgency here. “The Needle And The Damage Done” is a sad, beautifully dreary portrait of addiction, loss, and a wasted life and the talent lost. The line “Every junkie is like a setting Sun” is one of the truest, most accurate lines ever written in music of the modern era. Again, Young’s acoustic guitar, vocals, and lyrics combine to create a stark portrait of a suffering human spirit. The album closes with “Words,” an electric guitar excursion that is quite powerful in a remarkably understated way. The holistic beauty and healing qualities of this collection of work lies in it’s simple truths, the unadorned fullness of the music, and the mesmerizing vocals. Those who do not have Harvest on their shelf really need to secure a copy and get lost in its wonder for a while.